The Bhosle family is counted among the royal or Ksatriya clans of the Marathas. The Bhosle of Nagpur is known as Hinganikar as one of their ancestors who was probably a contemporary of Maloji, the grandfather of Chhatrapati Shivaji. Raghoji I (1734-1755 AD) became the first Maratha ruler of Nagpur. He was bold and decisive in action, twice his armies invaded Bengal, and he obtained the cession of Cuttack. Raghuji Bhonsle II was the last great king of this dynasty. 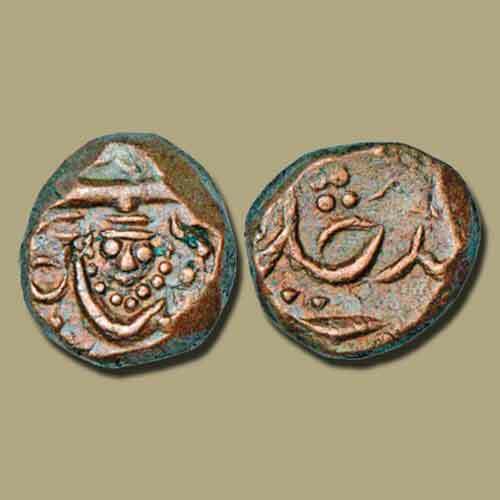 Coins of Bhosle were very similar to the silver rupees of Mughals and minted in the name of Emperor Shah Alam II. The reverse of the coins bears the Maratha Flag `Jaripataka', mint name, RY, and Julus formula. This copper Paisa was attributed to Bhosle of Nagpur showing the face of the deity on obverse and reverse has a legend. This piece was sold for INR 6,100 by Classical Numismatic Gallery.